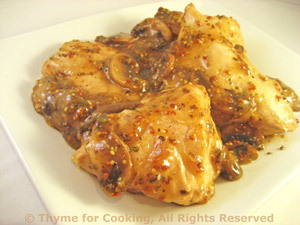 Chicken Breasts with Mustard and Mushrooms, Thyme for Cooking recipes. Heat oil in medium nonstick skillet. Add chicken breasts and brown on both sides, about 10 minutes total. Add mushrooms to pan and sauté 5 minutes. Add mustard, stock, Worcestershire to mushrooms and stir to scrape up any browned bits. Return chicken to pan, turn heat to low, cover and simmer 5 - 10 minutes, until chicken is cooked through. Add cornstarch mixture and stir until sauce has thickened slightly. Serve, spooning mushrooms on top.